Newly promoted, Grandmaster Taejoon Lee delivers his speech at his Hwa Rang Do 8th Dan Ceremony & Banquet. On May 23rd, 2009 in front of over 100 friends, family and students, Taejoon Lee was promoted to 8th Dan Black Sash Grandmaster and given the title of Kuk Sa Nim. During his speech, Grandmaster Taejoon Lee revealed the real reason for allowing his students to organize this beautiful and historic event — to honor his father, master and founder of our beautiful art of Hwa Rang Do, Supreme Grandmaster Dr. Joo Bang Lee. 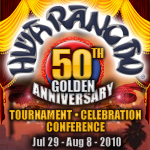 In a speech, which was heard from as far as a mile away, Grandmaster Taejoon Lee used the entire time he was at the podium to share on the sacrifices and courage of Dojoonim, as he ventured off into the land of opportunity, the United States of America, from his home country of Korea – to spread Hwa Rang Do and provide his family the best possible life. As Grandmaster Lee put it, his promotion to 8th Dan Hwa Rang Do Black Sash is not his achievement, but the achievement of his master, father and teacher – Dojoonim. Grandmaster Lee humbly delivered a heartfelt, yet thunderous homage to his father, for having made everything which took place that night possible. At the end of his speech, Grandmaster Lee called Dojoonim to the podium and to demonstrate his gratitude for all he had done for him, presented Dojoonim with a handcrafted sword, made and imported directly from Japan, with an estimated market value of over $10,000. The construction of the sword included an beautiful handle made of gold, brass and stingray skin. The steel blade was forged completely by hand benefiting from Japan’s centuries of rich tradition, science and art of sword making. Earlier in the evening, Dojoonim declared and announced to the world that Grandmaster Taejoon Lee in 20 years or at the time of Dojoonim’s passing, would become Supreme Grandmaster Taejoon Lee and 59th generation “owner of the way”, and pass the secret combat skills of the ancient Hwarang Warriors for yet another generation. All whom were present, were in awe of this magical and powerful declaration, for it ensures the preservation of our ancient traditions, martial art and history. We thank you for sharing this very special night with us. It will never be forgotten! 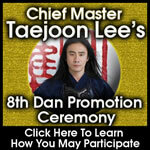 Visit the official Grandmaster Taejoon Lee 8th Dan Page featuring the documentary, “Inside the 1st Family of Hwa Rang Do & the Life of Grandmaster Taejoon Lee”. Good evening ladies and gentlemen, students, parents, and fellow Hwarang Warriors. I thank you from the bottom of my heart for your attendance and your support for making this event possible. Before I begin, I would like to take this time to recognize the members of the 8th Dan Banquet Committee for their hard work and selfless contributions in making this event a reality. Tony Diaz for the video presentation, which he has spent countless hours in reviewing over a terabyte of videos and pictures to extrapolate an eloquent yet powerful summation of the Hwa Rang Do family and my journey. Fernando Ceballos and Raymond Fong for implementing an effective online campaign to organize and raise the funding necessary to make this evening a great success. Rick Robbins for designing the classic look and feel of our online campaign. Daniel Gonzalez for designing all the graphic elements that went into the publishing of tonight’s event. Glenn Mantel for making it possible for me to present to you a small, yet poignant gift in the way of the danbong. Reynaldo Macias for accepting the daunting task of being tonight’s master of ceremony and for doing a fantastic job. Antonio Goodwin for connecting us with one of the top DJ’s in the country, Mr. Quick, whom you will witness in a short while. My Brother-in-law Danny Kim for providing the video projector. Joey Klein for organizing all the people involved to work together harmoniously in making the planning process as smooth and flawless as possible as their team leader. And, of course, my sister, Dr. Janet Lee for designing and creating the center pieces as well as coordinating this beautiful setting we are all graced with. And to my sister Stacie Lee for being the handy helper to both mother and Dr. Lee. The last couple of months have been quite interesting to say the least. I was first approached by Dojoonim over a year ago, when he invited me to test for my 8th dan. At that time, I humbly declined as I thought like a bottle of fine wine, I could wait a couple more years so that I can age properly. I have never been interested in acquiring higher dans as most other martial artists I have witnessed. The way I see it, rank is something that the master offers his student as a gift when the student is ready to carry the responsibilities of such title and rank. And, it has always been my philosophy that One Hwarang Should Conquer a Thousand, so no matter the rank, as a Hwarang we must always be prepared to accept whatever the challenge, however great or small. However, this spring marked the 100th Black Sash Examination and I could not pass up such important benchmark in our history. You are all here tonight thinking that you are honoring me. Well, if so then my “head fake” worked. As the late Randy Paush, a professor at Carnegie Mellon, dying of pancreatic cancer says in his last lecture which he gave in front of all his students and colleagues, that the greatest lessons are learned indirectly and he finishes his lecture by telling everyone that the lecture was not for you, but it’s for my children. So, I say to you, this banquet is not for me, it is for my father, my mentor, my master. My trials, my accomplishments are nothing. My hardships, my sufferings, I have none. All I am and have done dwindles in comparison to my master. My journey is smooth sailing in flat waters compared to my master’s journey through a tempest. He was born the fourth son of siblings of 7 children. He started his training at the young age of 4. He trained in the mountains of North Korea under the strict guidance of his master Suahm Dosa, a hermit monk. He escaped the communist regime of the dictator Kim Il Sung during the Korean War. He survived through impoverished, war-torn conditions during the Korean war. He left home to work and help support the family at 16 years old. He systemized the knowledge passed to him by his master into a modern martial art system, introducing it to the public for the first time in 1960 in Seoul, Korea. He had the first post-war nationally televised martial art expo in the largest and only sports stadium in Korea, Jang Chung Chae Yuk Kwan. He met with Korea’s former president, Park Jung Hee, and was given the responsibility to create one unified Korean martial art. He attempted twice to form the all Korean Unified Martial Art System, which was dismantled both times. In the process, he aided in the development of Kuk Sool Won, and Hapkido. He bumped heads with the former KCIA director and won his allegiance. He protected his community in Seoul against the rampant bullying by unruly thugs. 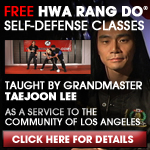 He created the Korean Hwa Rang Do Association and opened 28 schools in Seoul alone. He single handedly was responsible in bringing over all of the members of his immediate family to the United States which consisted of his parents, 2 sisters, 1 brother-in-law, 3 brothers, 2 sister-in-laws, 3 nieces, 4 nephews, 2 daughters, 2 sons, and his wife. He has revived the Hwarang Knights and brought their significance to the modern consciousness and to the minds of all martial art practitioners today. He has authored three books and co-authored three more. He was instrumental in elevating the hand-to-hand combatives of the Elite US armed Forces through mentoring and cultivating the former head instructor of the Special Forces Green Beret, the late Michael Echanis. 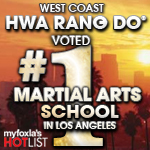 He secured the name Hwa Rang Do and all of its intellectual property by acquiring the first trademark for a martial art and copyrighted all of it’s curriculum for the first time in history. Without him, the world would have known of the Hwarang, only as a group of flower boys who rode on horseback and shot arrows, diminished as an archaic cultural side note on tour guidebooks of Korea. I have yet to mention of his physical prowess and accomplishments. He was the first to rotate 540 degrees in the air, striking a target 10 feet in the air with his foot. He has had cars and trucks run over his stomach. He has had thousands of pounds of rock slabs smashed over his body with sledge hammers. He is the first and last with only me coming close to have successfully completed a 5 directional cut of watermelons held against the naked stomachs of his students, while blind-folded. He has taken down a bull with one blow. And in the deep recesses of his mind, training under his master, he has fought against tigers. There’s a saying in Korea that when you live long enough, you shall endure all of its pain. As my father has been a witness to my journey, so too I have witnessed, fortunately or not, much of the hardships and heartaches that my master had to endure throughout his teaching career. If I have taught thousands of students, then he has taught tens of thousands of students. And, although the reward of seeing a person blossom, transform, and become the potential they all possess is priceless, it takes 1000 disappointments for one moment of satisfaction. Above all, we as Hwarang cherish and hold in the highest regard, the virtue of loyalty. If I have faced countless betrayals, then my master has faced too many for words to do justice. I have seen my father take in students from the streets in their teens and raised them as his own children, with my mother feeding and nurturing them with kindness and love. To the point where at times, I felt jealous as my father has always been the strictest with me. Only to have them grow into manhood, acquire a taste for power yet short on wisdom, and claim their superiority. To the unfathomable extent, where Dojoonim had to witness one of his students, whom he took in without question, once again treating him like his own son, in front of his face say, “With all of my vast knowledge of Korean Martial Arts, I have created Hwa Rang Do and all of it’s curriculum.” And, this all done after being sworn in under the name of God. Unlike most teachers, we parent. When teaching your children, just teaching is not enough. You must make sure they learn the lesson. And even though you have been scarred, dirtied from past disappointments, you must once again teach with conviction and love, for as children they can feel you more than they can hear you. And, even when you are at the brink of disillusionment in people, you must believe in them even when they do not believe in themselves. To be truthful, formal classes with Dojoonim for me, I can count with my fingers. It’s the lessons I have learned in observing him as a teacher, a father, a husband, a man, which are most profound and have taught me the most. Most of what I have been witnessed to are heartaches, pain and sorrow. I have never seen him adorned with great gifts from his students; I cannot remember when was the last time one of his instructors treated him to a fine meal; I have never seen him take a vacation or his masters treat him to one; and I am just as guilty. Most of what I have seen has been painful. I have heard student’s complaints and resentments of my master, which only showed me their lack of understanding, compassion, and only revealed their self-entitled nature. However, even after witnessing all of his trials and hardships, I was inspired to be like him. He was my mountain, he was the one. The one person, who have committed his entire life to one thing, to one love, to one passion. Whenever, I felt it was all too much, all too painful, when my heart lay wasted in pieces; all I needed to do was to think of my father, my master as he lived twice as long, and taught as twice as much, and have endured twice as much; I could not complain, but only admire. It is this I am an heir to. No raise in salary, no fortune, just more mopping. The lessons I have learned from him are too many to tell in one sitting. It will take a lifetime. So, I shall share with you all that I have learned from my master, if you will share your life with mine. And we shall mop the world together as one, to hopefully instill the power of one; to believe in the self as all great things started from one person, then when all the people are self-empowered, then hopefully we can all live together as one in peace, in harmony. There are too many people for me to thank. So before I close, I would like to recognize few of the people who are in attendance tonight who have made an impact in my life as well as made great sacrifices to be present. Sensei Taro Ariga for having an open mind, helping me to realize my vision of a new weapon fighting method. Master Fariborz Azhakh, whom I have known for over 25 years, for his guidance in keeping my dojang open and for helping me to revamp our organizational management. Dr. Mark Cheng, whom I have known for 20 years, for being a great brother and for keeping me in the minds of all martial artists. Jokyo Victor Garcia, whom I’ve known for over 25 years, for never giving up as I have challenged him to start over again, which for him at this point in his life is like climbing Everest for the second time in his 50s. Susuk Sabum Dylan Sirny for accepting me as his grandfather and for being my proof that we are on the right course. Susuk Sabum Scott MacKnight, whom I have also known for over 25 years, for his undying loyalty to me when I was a child and now hopefully a man. Colonel Richard Downie, whom I have also known for over 25 years, for his dedication to his country and never forgetting the Hwarang Spirit. My sisters, Dr. Janet Lee and Stacie Lee, for their unconditional love and support. And, mostly, to my mother as she is my teacher of compassion and forgiveness. I love you too mom. Also, to all my students for believing in me and always challenging me to be a better teacher. My father has said, that warriors do not retire, we die! Although, I am most honored and privileged to be the heir to Hwa Rang Do, I must endure the greatest loss in order to claim it. I will promise in front of all attending witnesses, that I shall do my best to secure Hwa Rang Do for the next generation, not only preserving my master’s life’s work, but fulfilling his vision. I will accept once again his challenge which he has set forth for me to be second, but making second remembered as much or more as the first. Dae Dan He Kap Sa Hap Ni Da.